In Bolivia we have learned that it is possible to feel burning hot and freezing cold in the same moment. The altitude is such that the sun burns thru clothes while at the same time temperatures are terribly low. Alejandro got quite sick in La Paz. I think he caught a cold from another passenger on the bus who sneezed and coughed the entire ride. That, along with the altitude and his usual respiratory problems knocked him right out. We spent two entire days holed up in the hotel room, thankfully it had cable and we’re completely up to date on all the WB sitcoms now. La Paz is a complicated place. We didn’t find it to be as ugly as the guidebook said it’d be, actually it is kind of pretty. However, traffic and pollution are the worse we’ve ever experienced, and we’ve lived in Mexico City so that’s saying a lot. The air is almost unbreatheable. Add the altitude, 3640mt (11942ft), and we found ourselves gasping every couple of steps. If harmful emissions and traffic were regulated, La Paz could be a nice place. There are so many street vendors (selling everything from roasted peanuts to clothes to electronics) that it is almost impossible to walk on the sidewalks. It is common in Latinamerica for pedestrians to not have the right of way; but in Bolivia, vehicles actually aim for you! We found ourselves in danger of being run over almost every block. Walking in La Paz is risking your life. Houses in La Paz are rarely finished because a finished construction is taxed at a higher rate than an unfinished one so houses are designed to be permanently “under construction”. However, since they use red bricks and roof tiles, when you look at the dwellings covering the surrounding mountains, they seem to blend in with the earth. We’ve found it very hard to relate to people here, their customs are jarring to us. People say things which are blatant lies without batting an eyelash; when we point this out they’ll pretend not to understand what we’re saying. Another annoying custom is that they won’t answer when spoken to if they don’t feel like it. Several times when we’ve asked to see something or want to buy something, the person will walk away without acknowledging us and we’ve stood there wondering if they’re going to come back or not; sometimes they do and sometimes they don’t. This happens at restaurants and street vendors alike, with cabs on the street, at hotels, even when buying airplane tickets at the airline’s own offices! In the time we’ve been here, nothing has gone according to what has been promised or should be. We dropped off our dirty clothes at a laundromat, when we picked them up we were missing about a third of them. The lady tried to convince us that we hadn’t dropped off that many. Good thing she had weighed it beforehand (they charge by the kilo) and the weights didn’t match. She then tried to convince us that the difference was the dirt they had removed. Really? She finally agreed to look again and suddenly “found” our missing clothes. Our clothes are all in different shades of gray now but we were so glad to have them back we didn’t even consider complaining. Our hotel was such a mess, the only reason we stayed was because Alejandro was too sick to be moved. We saw four different groups leave the hotel ranting against the staff. The showers were electric so getting the water to a comfortable setting was a matter of having a good ear to listen for the sound of the electric resistor when it turned off and jumping out of the way before you got a bucketful of cold water on your head. Too difficult for the kids to master on their own. The wi-fi which the hotel boasted of having didn’t work, although they tried really hard to convince us that it did and it was our own fault that we didn’t know how to use it. In their defense though, we’ve found that this is a common problem in Bolivia. Their concept of maid service is making the beds but forget about cleaning floors or bathrooms (this was the same in Sucre and Santa Cruz). After two days went by without having our room cleaned, I asked the receptionist to have it done; she answered that “as a favor” she’d send the maid. I pointed out that it wasn’t a favor but rather a service I had paid for and not received. She simply turned away and ignored me, and of course the maid never showed up. On our third day there, Fernando and I had to storm into the owner’s office and demand that he get his employees in line. He apologized profusely and promised us he’d fire the receptionist (we didn’t see her again so maybe he did), but the problem wasn’t just her. The problem is that bolivians have no sense of service whatsoever. After that incident, things kind of got better but we still caught several other hotel employees lying to us. By then, we had adopted the bolivian custom of turning our heels and ignoring the person; they were not offended. On our fourth day, we took a car city-tour trying to make it more comfortable for Ale. Another mess but by then we didn’t expect much so at least we didn’t get too annoyed. The tour began when the minivan picked us up from our hotel. We were about to take off when the driver asked where our guide was. Turns out she hadn’t arrived yet. We waited about 1/2 hour for her. When the entire tour is supposed to last 2 1/2 hours, half an hour is a lot to be waiting for the guide. 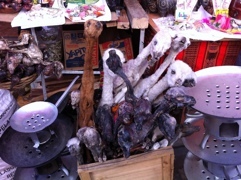 She took us to the Witches Market where we got to see mummified llama fetuses. People use them as offerings to the Pachamama (Mother Earth) whenever undertaking a new project. To keep up with demand, they feed pregnant llamas herbs that make them abort their fetuses. Alejandro was none too happy about this. and then merely by accident stumbled into the president Evo Morales convoy as he was leaving his office. I was afraid to whip out my camera and take a picture with all those armed men around though. We then visited Plaza Murillo. 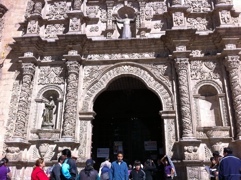 It is named after Pedro Murillo, the leader responsible for the independence of La Paz. This is celebrated every 16 of July, same day we visited. 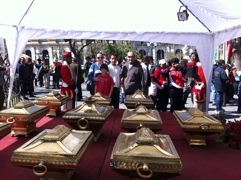 The urns containing the remains of his and other famous participants of this struggle are given honors here. After this we visited Calle Jaen where the museums are located. They were all closed for the festivities but it’s a nice stroll anyway. When we got back in the van, it didn’t work. We stayed there for an hour and a half while the driver kept turning the key and looking baffled when nothing happened. The boys ate all of our cookies and then took a nap. When we were finally annoyed enough that no one was doing anything to solve this, Fernando flagged down a cab and the guide agreed to continue the tour on it. We were quite cramped and it turned out the cabbie was better able to answer our questions about the city than the guide. We kind of wanted to lose her. We went to the Killi-Killi lookout. 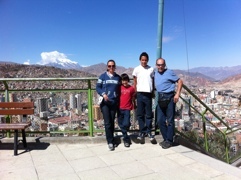 That’s the Illimani in the background which keeps guard over the city. What you can’t see is the Chalcaltaya in front of us. It used to be the highest sky area in the world up until they had to permanently close it down 4 years ago: due to the world’s changing climate, the mountain doesn’t have enough snow anymore. Isn’t that a shame? 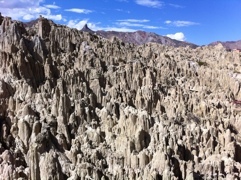 Then we went to the Valley of the Moon, so called for it’s moon-like terrain. Since the tour had so many delays, by the time we got back we were starving. Too bad for us because in Bolivia if you don’t eat at the same hours the locals do (around1pm), you won’t find any open eateries. We had planned on travelling to Uyuni to visit the Salar and on to Chile from there but a snowstorm had closed down the roads south so instead we decided to head east to Sucre. The bus ride to Sucre was 14 hours long and for only 10USD more we could take an hour flight. We decided to fly. Even the flight was messy. We arrived early that morning to find that our flight had been delayed an hour. 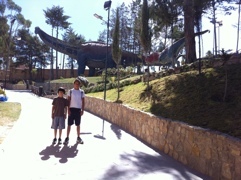 We had a layover in Cochabamba. From the airplane window what we saw of Cochabamba was so much pollution that the horizon wasn’t visible. The flight attendant announced that those travelling on to Sucre and Santa Cruz should remain on the plane. She did this so quietly that most people got off. When people began getting back on the plane, seat numbers were repeated so people started arguing about whose seat belonged to whom. After having two people argue over my head, I got annoyed enough and asked to see both their tickets. In fact, they had the same seat number but on different flights! Didn’t anyone check this before letting them board? I alerted a flight attendant and after she was convinced of this, she told people that the two flights would be fused and to just seat wherever there was an opening. After half an hour of people getting up and down and just utmost confusion they decided that there were not enough seats on the plane for all the people (gee, you think?) and announced that those going to Santa Cruz should get off. When this didn’t free up enough seats, they decided to nix the fusion idea and asked the other flight number off. During the chaos of people storing their carry-on and taking it out again, hallway full of people getting in and out; a young boy stuck his head in the door and loudly asked if this plane was going to Tarija. As if instead of a plane this was a local bus. We finally made it to Sucre two hours late but it still beats a 14hr bus ride. 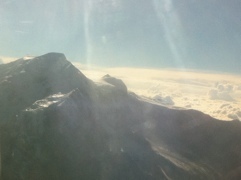 These are the Andes seen from the air, aren’t they beautiful? Sucre is a small quiet town. 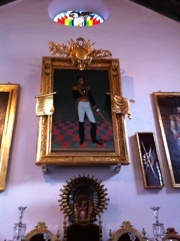 Bolivia takes its name from the great Liberator of America: Simon Bolivar. Sucre was established as the capital in 1839 and took its name from the second most important figure in Bolivian history: Antonio Jose de Sucre. Legislative power was transferred to La Paz in 1898 and local residents are still upset about that even though it’s been over a hundred years since. 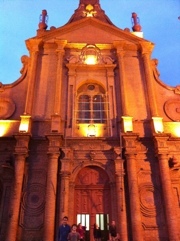 Sucre was the site of the first cry for independence from Spain in the Americas. We visited “La Casa de la Libertad” which is the house where the declaration of independence of “El Alto Peru” was signed and is still housed. Back then the nations of Venezuela, Colombia, Ecuador, Peru, Bolivia, parts of Chile and Argentina were all to be one nation: El Alto Peru. 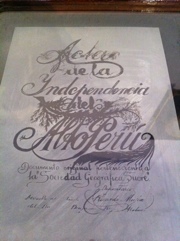 Simon Bolivar redacted the first constitution of the young nation in this house. As the years went by, the union dissolved and after several wars and mutual invasions they separated into the countries we all know today. 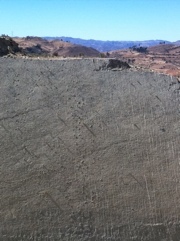 On the outskirts of Sucre, in a quarry belonging to the cement factory, Fancesa, tons of dinosaur tracks where found. The factory along with the government built a theme park around them. It’s a cute park with life-size reproductions of common dinosaurs such as T-rex and Brontosaurus, as well as lesser known ones such as Masosaurus but the highlight is the real tracks. 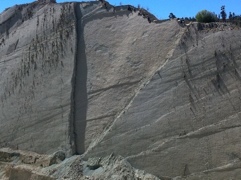 It used to be possible to visit them up close up until a year ago when rain washed off part of the wall. Now we’re only allowed to get as close as 300mts, about 3 city blocks. It’s a shame that they haven’t done anything to protect them from further erosion. From Sucre once again we took a 25min flight to Santa Cruz in order to avoid a 10hr bus ride. Getting on the plane was a nightmare! The guy at the x-ray machine didn’t like Fernando waiting too close to the machine for his stuff to come thru and decided to make life difficult for us by calling narcotics police. When they showed up with dogs, I decided to film the entire thing just in case. They threatened to physically hurt me and took Fernando away. I snapped pictures of all the involved officers and airport personnel and threatened to publish it all if any harm came to us. Aside, the airport manager told me that nothing would happen, that it was all just because the x-ray guy wanted to be difficult. The officer who took Fernando away also told him the same thing and added that people in Bolivia aren’t allowed to speak out loud. What the $&):@ does that mean? Seriously, try as we might we just can’t find where the nice bolivians are. On arriving to Santa Cruz we were kind of taken advantage of by a taxi driver who may have pretended to radio in to a hotel and get a reduced rate for us then dropped us off in the middle of a rainstorm at the hotel’s door. As soon as the taxi left, the receptionist announced that the rate had just gone up. Who the real con man was, we don’t know. We were disgusted and hailed a new cab that took us to another hotel. It ended up being cheaper than the “reduced” rate would have been. Our new hotel also boasted of having wi-fi and it does…as long as you stand right next to the reception counter. Santa Cruz has, as usual, a Plaza Grande with the Governmental House on one end and the cathedral on the other. Aside from this, the city is not much to look at nor does it boast any museums to visit. We honestly can not recommend anyone visit Bolivia. We’ve had a horrid time here, added to the scarcity of interesting places to visit and the lack of good food, it’s not worth spending your money here. Bolivia was a dissapointment for us and we wish we had flown straight to Chile from Peru instead of spending our vacation time here. We don’t have enough time to properly visit Argentina (our tentative next stop) so we’ve decided to instead fly off to Mexico City and spend our last vacation days visiting good friends and recovering from the shock Bolivia has been before heading home.